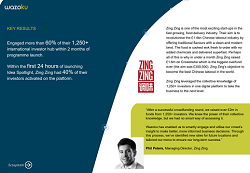 Zing Zing is one of the most exciting start-ups in the fast growing, food delivery industry. Their aim is to revolutionise the £1.4bn Chinese takeout industry by offering traditional flavours with a clean and modern twist. Zing Zing leveraged the collective knowledge of 1,250+ investors in one digital platform to take the business to the next level.